The Adirondack region is located in the northeast quadrant of the state. The Adirondacks comprise about 26 percent of the entire land area of New York State. This region contains hundreds of streams and hundreds of lakes and ponds. The most notable of the lakes are Lake George, Saranac Lake, Lake Placid, Tupper Lake, Long Lake, Blue Mountain Lake, Indian Lake, Cranberry Lake, and the Fulton Chain of Lakes. Among the more well kown streams in this region are the Ausable River, Saranac River, Indian River, Oswegatchie River, Grasse River, Raquette River, and the St. Regis River. Papa Bear's Outdoors is a private Adirondack lodge that offers the finest trout fishing and hunting opportunities in the Adirondacks! Papa Bear's Outdoors offers private guided tours and members only access to some of the best kept secrets in the Adirondacks. This is experiencing the outdoors as it ought to be! We here at the Adirondack Retreats lodge are open to all disciplines of trout fishing as long as catch and release is the end result. From canoe trips to remote ponds and the many lakes, our guides have their finger on the pulse of the action! July and August are the months to be in the Adirondacks. Saranac, Tupper, Schroon, Lake George, Indian, Paradox, just to name a few. We have the experts to take you out and experience a trip of a lifetime. Andrew Grisenthwaite is a New York State Licensed Guide for hunting, fishing, hiking, camping and canoeing. For guide services, I strive to provide a quality outdoor experience for all those involved regardless of the weather and physical ability. Custom outings for those who would like to experience a combination trip or require special services can be arranged. Trips can be planned in the Adirondack Mountains, Tug Hill, or Central New York. These different regions offer many possibilities for an outing and we are able to arrange the trip to suit the clients' individual interests. Russell Trieller is a New York State licensed fishing guide who has been fishing the Adirondacks and the Saint Lawrence river since 1989. 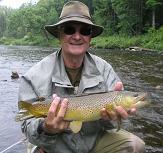 He fishes the Lake Placid, Saranac Lake and Paul Smiths areas for whichever species you may want. Whether it is cold water species, such as trout or salmon, or warm water species, such as northern pike or bass, he can bring you to them. Several local lakes contain both types of fish and are a favorite because they afford the angler an opportunity to fish for several kinds of fish in one trip. All fishing is done from our 16 foot Lund which provides a safe and comfortable fishing platform. The boat is equipped with two Cannon downriggers for trolling baits deep in open water. Casting the shoreline for bass and pike is done with the aid of a Minn Kota electric trolling motor. So whether the fish are in the wood, the weeds or suspended in open water we are prepared. Robert Sauer-Jones, a NYS licensed guide, (license #2708), was born in the Catskill Mountains. He has been hunting and fishing since he was "knee high to a grasshopper" and has spent his lifetime learning about the habits and patterns of wildlife in New York State.An avid fly fisherman, Bob ties his own flies and enjoys the sport of fishing for the native trout found in Sullivan County lakes, streams and rivers. Bob strongly supports the catch and release program. Well versed in spin fishing, Bob will offer a variety of fishing experiences based on the client's expectations. Fly fish three of New York's best trout rivers the Ausable, the Delaware, or West Canada Creek with expert fly fisherman and guide, John M. Sweeney. John has over 47 years of fly fishing, fly tying and entomological experience which renders him superbly qualified to make your fly fishing dreams come true. His patience and teaching skills have helped many young or novice fly fishers succeed, and his knowledge of a wide variety of fishing techniques will increase your opportunity to hook a trophy trout !! If your looking for family fun in the great outdoors of upstate New York you've found it! Whether it's fishing, hiking, camping, floating down a river or any combination of such we have the thrill your looking for. Each summer we take to the hills of the Adirondacks for these adventures- why not come and join in for some Adirondack fun. We are a full service guiding outfit. We fish throughout NY for all species in season in both Fresh and Saltwater. We cater to beginner and expert alike.